Researchers are developing a new rooftop device that can make solar energy and cool a building at the same time. It cools buildings by beaming heat directly into space, say scientists from Stanford University. Solar energy or solar power involves capturing the Sun’s energy and converting it into electricity. Shanhui Fan says he wants to revolutionize energy-producing rooftop devices. Fan is a Professor of Electrical Engineering and a Senior Fellow at the Precourt Institute for Energy at Stanford University. He is also Director of the Edward L. Ginzton Laboratory and a Professor (by courtesy) of Applied Physics. Prof. Fan and colleagues from Stanford and the University of Michigan wrote about their work in the journal Joule (citation below). The sun-facing layer of the rooftop device is made of the same semiconductor materials that exist in current solar panels that exist on millions of rooftops across the world. Its bottom layer, on the other hand, has materials that can beam heat away from the rooftop. Through a process we call ‘radiative cooling,’ they beam the building’s heat directly into space. In radiative cooling, objects shed heat by radiating infrared light. Many animals, including humans, do this. Infrared light is the invisible light that we can only detect if we wear night-vision goggles. In most cases, radiative cooling is not an effective way of cooling a building. The Earth’s atmosphere, which acts like a thick blanket, traps most of the heat near the building. The heat that does escape subsequently ends up in the vast coldness of space. Earth’s atmospheric blanket has holes in it. A particular infrared light wavelength can get through the holes and pass directly into space. The cooling technology in this rooftop device takes advantage of these holes in the atmosphere. In a previous study, Prof. 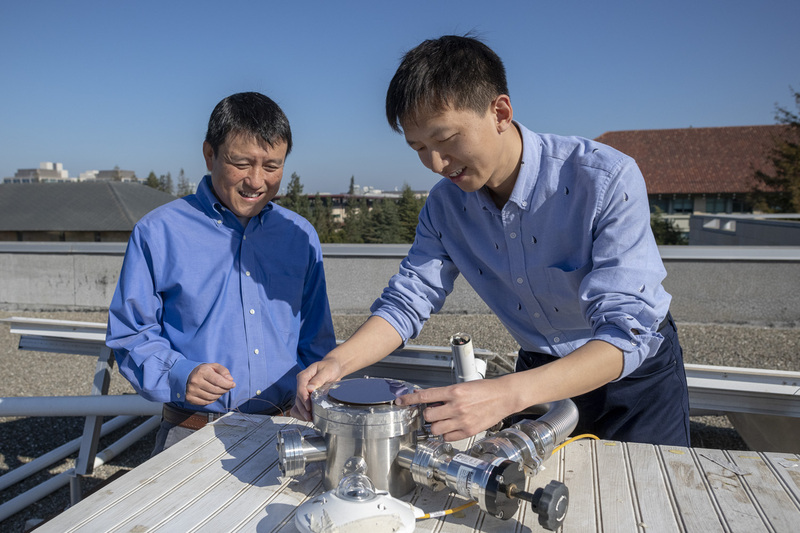 Fan had developed materials that can convert the heat that radiates off buildings into the particular infrared wavelength that can pass directly through the holes in the atmosphere. These materials release heat into space. They could save energy and would have been needed to cool down a building’s interior using air-conditioning. Prof. Fan and colleagues placed that same material under the standard solar layer in the new rooftop device. The researchers then compared the temperature of the rooftop’s ambient air with the temperatures in the device. Specifically, the temperatures of the top and bottom layers of the rooftop device. The device’s top layer was warmer than the rooftop air. The researchers expected this given that it had been absorbing sunlight. The bottom layer, on the other hand, was considerably cooler than the ambient air of the rooftop. They had also expected the bottom layer to be cooler. The researchers were not able to test whether the rooftop device also generated electricity. In this experiment, the upper layer lacked the metal foil that is present in solar cells. The foil would have stopped the infrared light from escaping. They are currently designing solar cells that can work without metal liners to couple with the bottom layer, i.e., the radiative cooling layer. “Simultaneously and Synergistically Harvest Energy from the Sun and Outer Space,” Zhen Chen, Linxiao Zhu, Wei Li, and Shanhui Fan. Joule (2018). DOI: https://doi.org/10.1016/j.joule.2018.10.009.